My normal to combination skin loves a little pamper. I love skincare products, the better your skin is, the more happy you are. I don't have any breakouts problems at the moment, but my skin is slightly dehydrated on the cheeks and nose area, note to myself drink more water! Clarins HydraQuench Cream is just amazing as make-up base! It's very light on the skin and absorbs really quickly. It's doesn't leave the skin feeling sticky as some moisturises do, the cream doesn't contain any SPF, so you will need to apply different SPF cream underneath, to keep your skin protected. The formula is really light, I like that it does keep the my skin re-hydrated. I am actually very curious about the new gel formula version, I have been using the sample and I love it so far! The cream has a very lovely scent, which isn't overpowering and it's goes away within few seconds. Kiehl's Midnight Recovery Concentrate is a lovely facial oil. As you can guess from the name, this is a night product. You can either add a drop to your night cream or use it alone. I like to apply alone, but from time to time I do mix it with a night cream. It does leave a oily layer on your skin, but it's okay, as it's doesn't transfer on your bed sheets. In the morning you will also wake-up with slightly oily skin, but your skin will feel amazing afterwards. I would also recommend it to people with very oily skin, as even oily skin needs to be kept moisturised. I am in love with the kind of organic scent, which is impossible to describe. I like that the bottle is see-through so you can see how much product you have left. 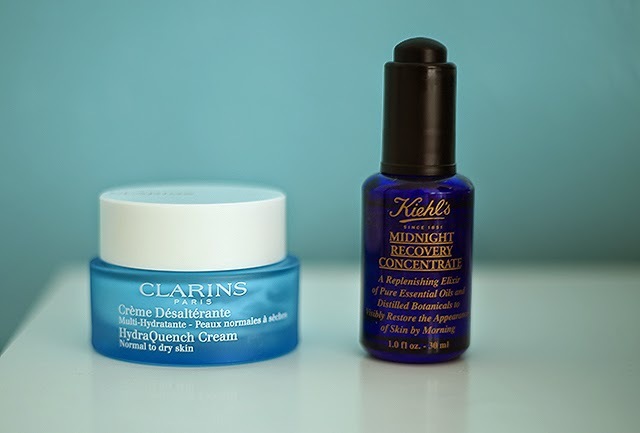 Every time when I use up a product, I switch to something new, still looking for my perfect moisturiser to use during the day, this doesn't mean that I don't love the Clarins one, but I just love testing new products. Although, I do tend to go back to my favourite skincare products, which work with my skin well, mostly when I am suffering with really bad skin days, then I like to go back to products, which I know I can trust.